God Listens When You're Afraid is a delightful little book of prayers for children and their parents to help them through their fears about animals. In writing these prayers, Carol Adams shows her sensitivity to children's fears, and never dismisses them or tries to convince the child that the animals won't hurt them. Instead, Carol turns the children's fears into prayers, and asks God to help them through their fears, and most importantly, the prayers let the child know that God understands their fears and will help them. 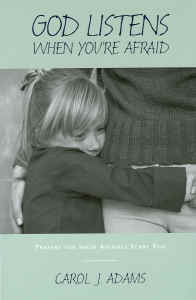 God Listens When You're Afraid is a must read book for all children who have a fear of animals, and their parents.